There are two apps for Android devices that allow you to take notes as handwriting. This is handy in that it can be a little faster than typing, even allowing you to draw figures if needed. The reason handwriting is useful with Evernote is that Evernote is able to recognize and index handwriting found in images, . . . legible handwriting. The ability to find hand written notes through the Evernote search function gives new life to the use of penmanship. 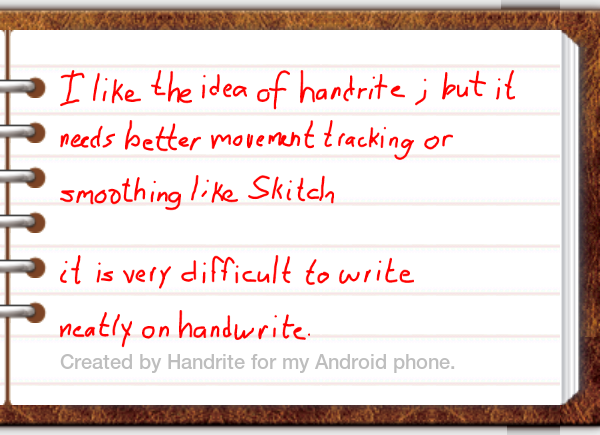 The first handwriting app is Handrite. I like it because it has writing guides that help you more or less keep letters the same size and your writing straight across the page. 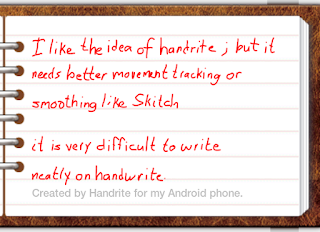 Handrite is geared towards writing text. You can technically draw items; but, they will be resized to fall within the size of your text. I default to Handrite whenever I need to jot down something quickly. However, it needs work on tracking your finger movement. Writing in a hurry leaves a mess of sticks and circles. Notes are exportable to Evernote. 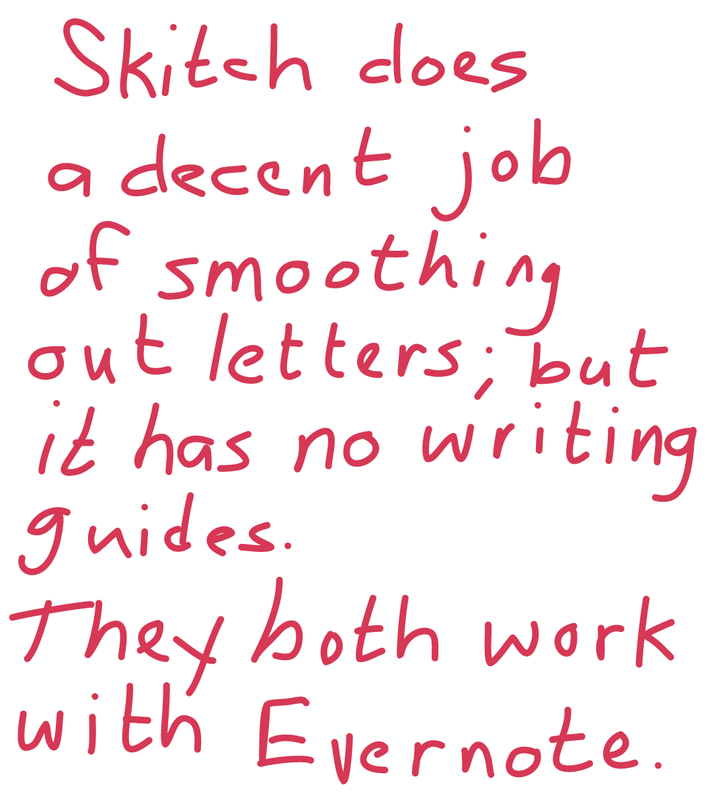 The other handy Android app is Skitch, which is owned by Evernote. Naturally, they work well together. Skitch is better suited to drawings and photo notations. 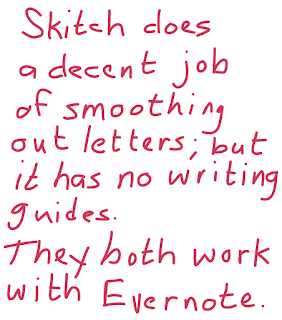 Skitch does not have writing guides, so you pretty much have to be mindful of your own margins and letter size. What I like about Skitch is that you can add any drawings in whatever size you choose. You can also annotate photos, on the photo itself, or around it. Skitch added auto-smoothing which gives your text a much better appearance. Of course, notes are exportable to Evernote. The only issue I have with Skitch is that it does not keep an archive of notes for you to append new notes. Still, it's very useful. There are other handwriting apps for Android I have not tested. I agree, most times typing is better. Swype makes all the difference for me. In instances where I have to write serial numbers or mixed combinations of letters and numbers, writing works best. It is too clumsy to do with a touch keyboard.